Mildly acidic white vinegar dissolves dirt, soap scum and hard water deposits from smooth surfaces, yet it’s gentle enough to use in solution to clean hardwood flooring. 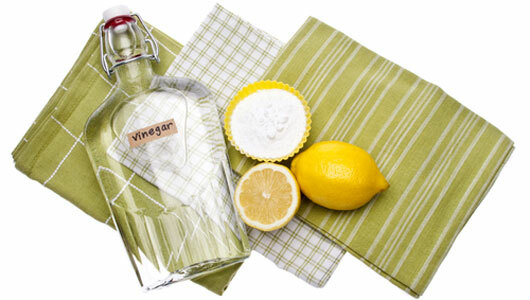 White vinegar is a natural deodorizer, absorbing odors instead of covering them up. (And no, your bathroom won’t smell like a salad. Any acid aroma disappears when dry.) With no coloring agents, white vinegar won’t stain grout on tiled surfaces. Because it cuts detergent residue, white vinegar also makes a great fabric softener substitute for families with sensitive skin. In the kitchen, use vinegar-and-water spray to clean countertops, lightly soiled range surfaces and backsplash areas. In the bathroom, spray countertops, floors and exterior surfaces of the toilet. For really tough bathroom surfaces such as shower walls, pump up the cleaning power by heating the solution in the microwave until barely hot. Spray shower walls generously with the warmed solution, allow to stand for 10–15 minutes, then scrub and rinse.